Also something about sticks and rope I dunno. Hideo Kojima has revealed a few vague details about his upcoming Death Stranding, at the ongoing Tokyo Game Show. Kotaku summarised, stating that it's an action game set in an open world, with a Kojima-style story, and featuring some kind of online element. He went on to talk about action games in terms of sticks and ropes. Most games have players whacking each other with metaphorical sticks, while Death Stranding will use metaphorical ropes, creating links between players that...look, I don't know, but Kojima's hoping to usher in "the future of gaming". 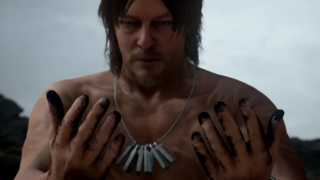 That's all he'll say about Death Stranding at the moment, and there might be a reason for that: Kojima Productions is only just now getting into the actual development part of the game. It now has an engine though, while the team has an office to work in, so that's good.